As the title suggests, this jewellery collection is created with chocolate. I have designed three collections made of necklaces, bangles and rings that are small edible jewels, ornaments suggesting tender and love messages. Worn on the skin they blend slowly emanating a sweet scent. 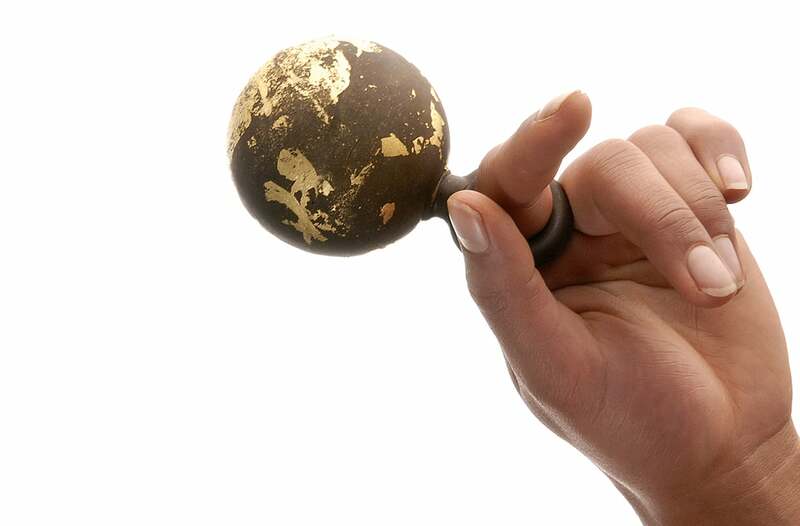 boules This is a collection of jewellery composed of dark chocolate empty balls, coated with edible pure gold leaf. Freely clustered around a circle, they create necklaces and bracelets. The ring represents the primary form. ruggine (rust) Looking like rusty iron chains in appearance, these necklaces are created using an old confectionary technique by maître chocolatiers with bitter chocolate powedered together with cocoa powder.